Let me tell you how YOU can support a local business, as well as someone living with mental health challenges, in the community. Margaret’s is excited to announce that Metro Drugs, a local pharmacy here in Toronto, is kindly holding a fundraiser on behalf of Margaret’s! This fundraiser will take place over the next 3 months, from now until the end of October. When you make a purchase at Metro, you can donate $2, $5, or $10 at the register or round your purchase up to the nearest dollar – doesn’t get much easier than that! The most exciting part is that the owner of Metro Drugs, Mike Demian, is matching every dollar donated, up to $7,500. This means that together, we have the potential to raise $15,000! This financial support will have HUGE impact on the Margaret’s community, as it will go towards our community housing projects, providing permanent housing for those in need. If you find yourself in any of the listed areas below, please stop by and make a donation! This is a win-win scenario. 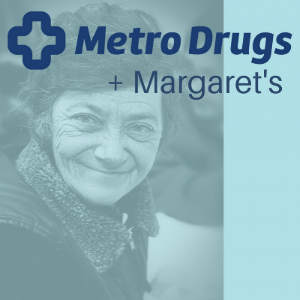 Metro Drugs has played a special role in the Margaret’s community over the past 10 years as both a donor and major support to our clients. This is the only pharmacy Margaret’s clients use to fill out their prescriptions. Metro’s amazing staff aid our clients in realizing a greater sense of stability and independence in their lives. Metro’s staff is patient, knowledgeable and responsive, so please give stop by and say hello (and don’t forget to tell them Margaret’s sent you)!